Scaling and fouling in Plate and Frame Heat Exchangers (PFE) results in significant loss of performance and negatively affects energy efficiency of the system. In severe cases, the buildup could be so thick that it results in a clogged exchanger – unable to be cleaned in place (CIP) with acidic cleaning techniques. This leads to production stoppages for cleaning and ultimately results in increased production costs. Recent studies from the chemical, district heating, oil and gas, and power plant industries have introduced compelling evidence that altering the surface of the plate with a thin layer of antifouling coating mitigates the buildup of fouling and, thus, reduces maintenance stoppages. Conversely, a thin layer of coating no matter how thin still creates a thermal insulating barrier. Important considerations with this approach revolved around the negative effects on thermal resistance and heat transfer. The same studies also focused on this topic, and indicated a thin thermally-conductive-antifouling-coating-layer allows for far more heat transfer than a layer of scaling and fouling material of the same thickness. Curran International successfully coats PFE heat exchangers for clients in the oil and gas industry. The scope includes applying a thin layer of antifouling-conductive-coating to both sides of each plate, while ensuring that gasket areas are protected and left uncoated. To ensure the coating material was applied to the proper thickness, each plate goes through a quality control process. 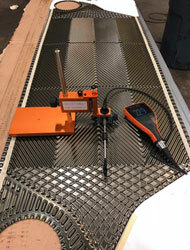 Dry film thickness measurements are taken using an Elcometer® with an angled probe placed in a Probe Placement Jig to verify that specified thicknesses of the Curran Coating were achieved. The goal is to utilize a thin film coating specifically formulated for antifouling – applied as thin as the specification would allow. This would ensure the coating adhesion and curing mechanisms will not be affected while ensuring the most thermal-conductivity was achieved.